This has been the week of the wind machine in Washington with a series of cold nights from last Tuesday through Sunday. Temperatures in some of the cooler areas of the Walla Walla and Yakima valleys dipped into the low 30s and even high 20s in some locations. 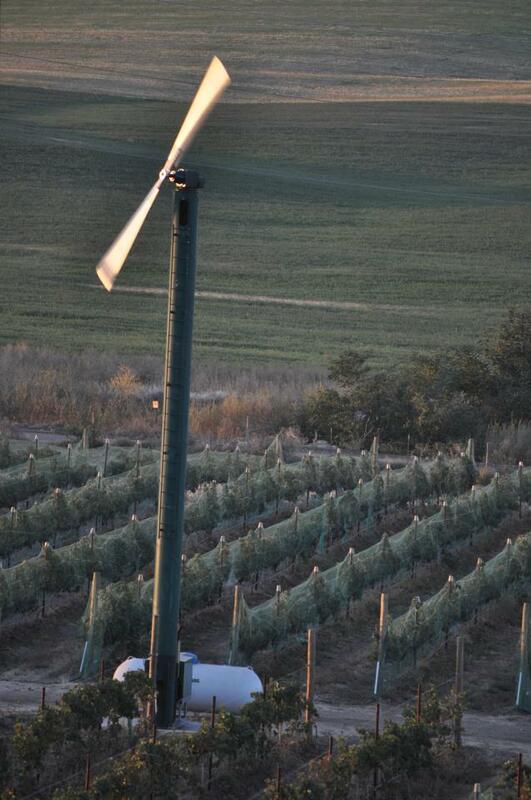 While some did report frost issues, many were able to keep the frost at bay by using wind machines. “We started running wind machines on Tuesday night and have been every night since,” one wine grower in the Walla Walla Valley said yesterday. “The forecast for tonight is around 35 degrees so we should be out of it.” Meanwhile on Red Mountain temperatures dipped down to the high twenties on Friday but wind machines kept temperatures a few degrees higher allowing the growing season to continue. Richard Funk at Saviah Cellars says that, as of the end of last week, his estate vineyard in the Rocks had dodged some bullets. “The Funk Estate Vineyard only hit 35 yesterday and 34 this morning,” Funk said Thursday. Like many, he is hoping to see the growing season continue a few weeks longer. “We will pick some of the Syrah this week where we have one cluster per shoot and waiting a little longer for the rest,” he says. Overall, Funk is excited about what the 2012 vintage holds. “Very nice ripening weather this fall with very good color development, nearly ideal fruit chemistry and velvety, fully mature tannins in the Merlots we have picked,” he says. Funk reports that he has about a third of his fruit in and expects to continue into the first week of November, weather permitting. Notaro, who works with several different clones of Cabernet, says it has been interesting to watch the differences through the growing season. “I recall standing between clone 8 which was 70% through (veraison) and the clone 10 which was barely starting,” he says. “There's big differences in how they taste now as well.” Notaro also notes that Cabernet Franc was slower to finish veraison this year but subsequently has ripened more quickly than Cabernet Sauvignon at his sites. Over on Goose Ridge, winemaker Justin Michaud of StoneCap Wines notes that while the temperatures were warm this year, they seldom got too hot. “In my view it seemed like a great summer because we had very few days of temperature over 95,” Michaud says. “We did have a bit of a cool wet spring along with back to back cooler vintages, so we saw a slightly smaller crop at set.” He hopes to be finished picking by Halloween but notes that early November seems more likely. Meanwhile winemaker Bob Betz of Betz Family Winery sums up the thoughts of many on the vintage. “We are bullish on the 2012s,” Betz says. “Color, dimension, expression and concentration should mark the reds of 2012.” He looks back on the growing season as follows. “Despite the cool spring, 2012 will be remembered for the sustained warm to hot temperatures and consistent high light intensity,” Betz says. “By mid June the Columbia Valley had established a pattern of persistent warm temperatures that has lasted into early-mid October. Warm vineyard sites saw several days that reached or surpassed the 100° F mark. As we entered October the daytime highs were still in the 70s and low 80s but nighttime lows dipped into the low 30s in some places. Betz agrees with others who have noted that berry size has been smaller this year. “We aim for 1 gram/berry on Cabernet Sauvignon, 1.1-1.25 grams/berry for Merlot and 1.2-1.3 grams/berry on Syrah. In almost all cases the berry weights have been lower,” he says. Betz says that he has 60% of his fruit in and expects to have 80% in by the end of the week. Picture courtesy of Jan Roskelley of Tero Estates. Follow the winery on Facebook here and on Twitter here. Read previous harvest reports here. Last pick on Red Mt.